I want to express my solidarity with youth, with our citizens, who really are not indifferent about the fate of their country and are actively manifesting their position as citizens. 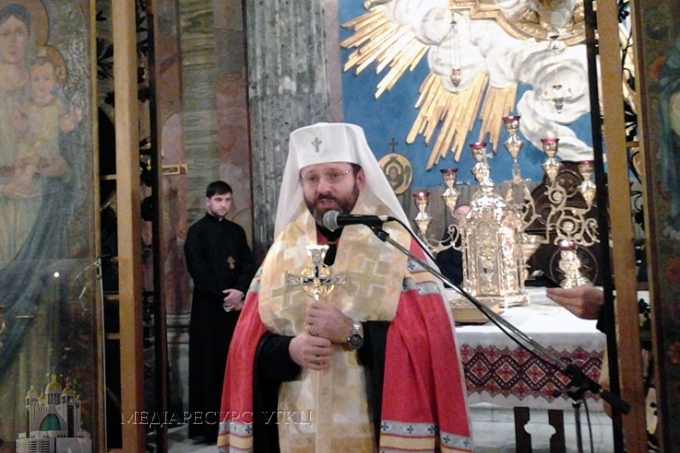 This was stated today, November 24th by the Father and Head of the Ukrainian Greek-Catholic Church, His Beatitude Sviatoslav (Shevchuk) in Rome , during the blessing of the restored ancient vestment of the miraculous icon of Zhyrovytska Mother of God in the Church of Saints Serhiy and Bacchus in Rome. “We see how hundreds of thousands of people in various cities and towns of Ukraine and the world have come out to the maidans. Today we even saw how teargas was used near the building of the Cabinet of Ministers in Kyiv. Today here we are praying and in our prayer I want to turn to all those in Ukraine. With great trepidation we are following the events which are happening today, especially on this day, this Sunday,” noted UGCC Head. His Beatitude Sviatoslav appealed “to those on the maidans, and those who today bear responsibility towards the people, as our national elected ones and those who are the representatives of various civic organizations and political parties, the law enforcing employees, our government – not to permit violence.” “Not to permit the shedding of even a drop of blood, so we do not ruin our future,” emphasized UGCC Prelate. He also urged all to pray today for peace: “Let us pray that no hot head destroys this peace. Let us pray that in all these complex moments that we are experiencing right now, we remain until the end, a civilized European nation, of which we want the whole world to be aware” appealed His Beatitude Sviatoslav, UGCC Head.